Considering the rate at which cancer kills, one may be compelled to ask why adequate awareness about it is not given primary attention. Prostate cancer is the second most common cancer affecting men on a global scale. Little or no attention is paid to prostate cancer particularly in less developed regions like Africa. However, this is changing as organizations now exist who have committed themselves to sensitization, detection and treatment of prostate cancer in Nigeria. 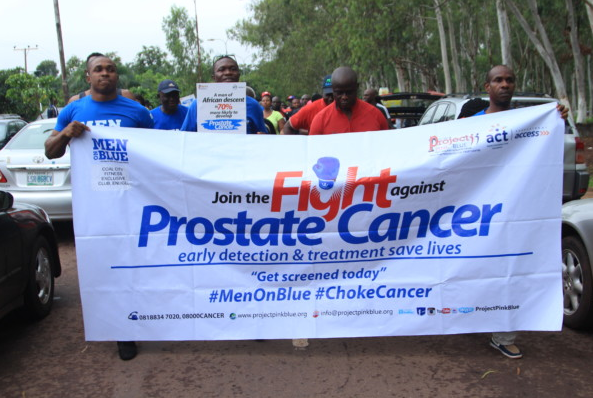 Through the ACT Foundation supported #MenOnBlue Cancer Walk, Project Pink Blue (PPB) is on a mission to increase the level of prostate cancer awareness in Nigeria through means of enabling ease of information on the disease and imploring a strategic media campaign that is aimed at reaching 50 million people directly and indirectly towards the end of 2018. To achieve this feat, Project Pink Blue has embarked on a multi-stakeholder inclusion strategy geared towards getting everyone involved in the fight against prostate cancer. Project Pink Blue has taken the #MenOnBlue train to three states across Nigeria so far including major cities like Enugu and Abuja. The #MenOnBlue Cancer Walk is set to come down to Lagos in a bid to reach 2,000 men at the end of the campaign. CEO of ACT Foundation, Osayi Alile noted that the effort put into creating awareness about prostate cancer in the past has been rather minimal, and that there exists a pressing need to educate Nigerians on the importance of disease prevention particularly cancer in all forms. “If we can begin early enough to muster support towards sensitizing and screening, then surely we can achieve a significant reduction in incidents associated with the disease”, she advised. ACT Foundation is a grant making organization established in 2016 to support local, national and regional nonprofit organizations working to address challenges and associated vulnerabilities across the African continent.